Choose between a 1 or 2 pound bag (approx. 6-7 bulbs per pound) of fresh Gilroy garlic. We sort these bulbs to provide you with good sized heads of fresh, firm garlic. These are perfect for baking or any of your other fresh garlic needs. Packaged in a burlap bag. 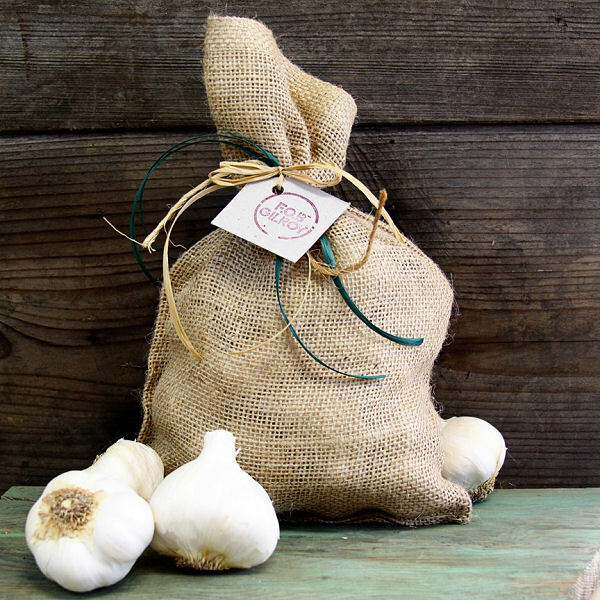 Please note that fresh garlic cannot be gift wrapped due to its perishable nature and gift wrapping will cause it to decay. For cooking purposes, California garlic (the variety used to make braids), lasts about 9 months from the July/August harvest. Because of this, it is difficult to guarantee the freshness of our fresh garlic products between January and July each year. Therefore, we will not ship fresh garlic between February 1 and July 15, or until the new harvest. In addition, we will be unable to issue refunds on these products regardless of when they were purchased. Order this and 3 days later arrived at front door. Garlic was fresh and tasty, and the service is pretty good. This is the 1st time I've ordered the garlic this way and am so pleased with it! It's beautiful and came to me in good shape. Loved the individual garlic bulbs. They were much larger than expected and the quality is wonderful.